You’ll often find custom code snippets on sites such as this one, asking you to paste them into your theme’s functions.php. While this is useful, it’s also dangerous because your code will simply get over written by the next theme update. The standard advice is to create a child theme. You can read my tutorial on creating child themes here. But then your code will not carry over if you change your theme itself. Many code snippets provide general functionality, and are not specific to a particular theme. A better solution is to create a WordPress custom plugin of your own to hold all your custom code. This way, your changes will be preserved through theme updates, as well as theme changes. Moreoever, it makes logical sense to separate custom code from the theme, since the two typically have very little to do with each other. A WordPress custom plugin will neatly abstract all your changes and make them future proof. Here’s how to go about it. To make things easy, I’ve done the hard work for you and created a blank plugin, ready to accept all your custom code. Here’s how to install it. Download the custom plugin from here. It’s just a zip file with one folder and one directory. Once done, choose “Install Now”, and then activate the plugin when it asks you to. That’s it – you’re done! 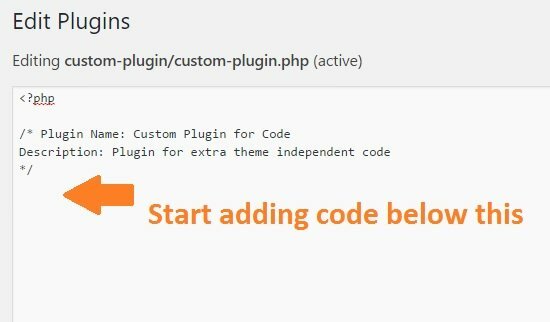 You’ve installed your own WordPress custom plugin for code. Update: This tutorial has been updated to reflect the WordPress update that disabled direct plugin editing. These are new screenshots to guide you through the new process. Once you’re done, save your changes and your custom code will be active on your site. In the above example, I’ve deliberately made a syntax error by typing }} in the custom plugin. As you can see, WordPress handles this gracefully by chiding me with an error message and disabling it. If this had been a functions.php error, your WordPress site would have broken with the famous “White Screen of Death” and you’d have to use FTP to access functions.php and get out of the mess. So compared to functions.php, a custom plugin is much safer. As a result, I’ve hardly had any “white screen of death” problems ever since I moved to a plugin based approach to custom code years ago. The second benefit is that you don’t need to create a child theme! You can make all modifications in the plugin itself and you can use an external CSS solution like Jetpack to hold your custom CSS. Since it’s much more difficult for you to create a child theme, than merely uploading a ready made plugin in like in step 1, I feel that it’s a superior approach to custom code. You may have noticed that there’s no closing ?> PHP tag in my custom plugin file. This is an accepted best practice to leave it out of functions.php and plugin files. The reason is that its presence can give rise to complications if you accidentally leave a newline or blank space after it. And such errors are notoriously hard to debug. So to prevent all that, I don’t use a ?> closing tag at the end of my code. I hope I’ve convinced you that placing custom code in functions.php is a bad idea. A plugin provides you with much more flexibility and abstraction. And it keeps your site from crashing as well! What’s not to like? Hello, after installing “Custom Plugin for Code” I see no option for edit, only for disable. What I have to do to have possibility to edit this plugin? It could be a permissions issue. Are you the site owner or administrator? I am having the same problem. No way to edit the plug in. I don’t believe it is a permissions issue. Help? Although I’m new to WP, I believe that the interface has changed. What you now need to do is is select “Editor” from the “Plugins” main side menu. It will give a warning about the dangers of changing the code, but once you accept and go forward you will be presented with the text editor. It will default to the first Plugin in the list, so go to the “Select plugin to edit:” drop-down in the upper right-hand area. Choose the “Custom Plugin for Code” and click the SELECT button. You should then see the plugin code in the editor. You piss me off a bit. You do not mention the plugin needed for inserting the code in the article. Instead I find someone asking about it in this comments section. Then I decide to download a plugin from a random site and not the official WP plugin library. This I would generally not do since it is a SECURITY RISK ! And when testing it out it has no EDIT button as you instructed us to click ! Article somewhat helpful but the secret must have plugin didnt even have an edit button. That makes paranoid me wonder what you have done to my site !? Actually, you’re right. Since the time I originally wrote this article, WordPress has changed the way we edit plugins. I’ve updated the article to reflect the new process. Sorry for the outdated info! You can find the updated method in Step 3. I found that the comments on this page had a solution to using the plugin. It works but a little confusing getting the information correctly.